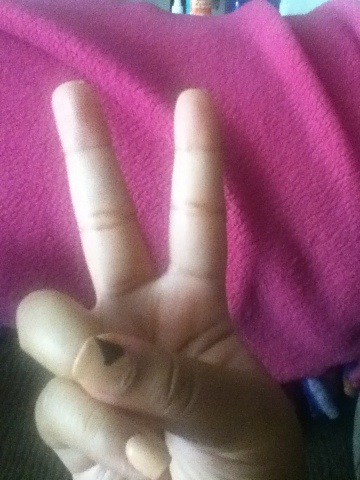 I know I haven’t been on in a while, so I’m giving you a little something. I went to Sally’s Beauty Supply, and they were having a sale. Buy two nail polishes get one free. The first time, I ended up leaving with “Princess Grace” “Blue Iguana” and “Rainbow”. I have to say that out of those three, Princess Grace is my favorite. It looks elegant and refined but is still fun. On the return trip to Sally’s, the sale was still going on so three more bottles of China Glaze nail polish were procured. This time I left with “Sunset Sail” “Platinum Silver” and “In The Lime Light (Neon)”. Now I’ve only tried out three of the six on my hands. I have the “In The Lime Light” on my toes, and it looks awesome, but I want to see it up close before I make my final decision. Those are a few shots of the Sunset Sail mani I did. My thumbs were the accent nails with a directional arrow on the side. (Scotch tape was used.) I like how it came out. 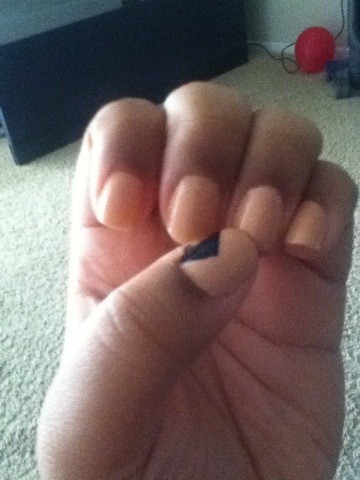 You can’t really tell in the picture, but the nail polish is very creamy looking. I was hesitant to get this because I was worried it wouldn’t look right, but I’m glad I got it. It goes great with my skin tone and looks like flesh. I also love it because it’s a warmer type of look. It’s not austere, but you could pass this off as work acceptable. 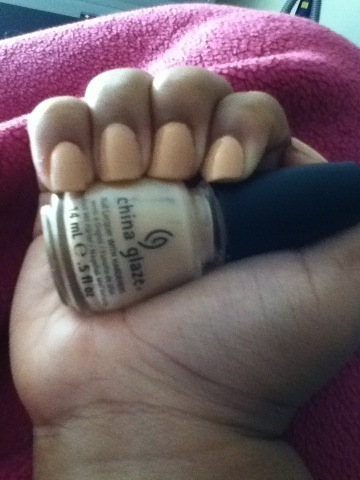 As I use the colors from China Glaze, I’ll post the end results here.